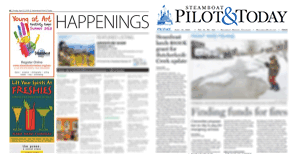 It was disheartening for me to read the article in the March 15 issue of Steamboat Pilot & Today that described “improvements” to Rita Valentine Park promoted by Steamboat Digs Dogs. One rationale for fencing part of the park is that wildlife will be protected from dogs. To my knowledge, there have been no adverse wildlife encounters with dogs at the park since one reported in July 2014. Although many attempts have been made over the years to “improve” or “develop” the park, they were denied by Steamboat Springs City Council. Consistently, there has been strong opposition to erecting any sort of structure on the park. Today, Rita Valentine Park is open land with natural vegetation and trails. It is used by walkers, bikers, skiers, people on snowshoes and dog owners without impediment. Rita Valentine Park is not a dog park. It is a city park that is unique in that no structures or fences, for example, have been erected on it. The park ought to be preserved in its current state. There is no defensible reason to impose any structure or change in vegetation on that land.